Go in Action introduces the Go language, guiding you from inquisitive developer to Go guru. It begins by introducing the unique features and concepts of Go. Then, you'll get hands-on experience writing real-world applications including websites and network servers, as well as techniques to manipulate and convert data at speeds that will make your friends jealous. 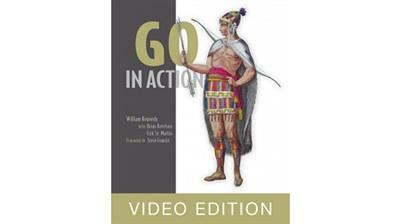 Go in Action is for any intermediate-level developer who has experience with other programming languages and wants a jump-start in learning Go or a more thorough understanding of the language and its internals. This book/course provides an intensive, comprehensive, and idiomatic view of Go. It focuses on the specification and implementation of the language, including topics like language syntax, Go's type system, concurrency, channels, and testing. Application development can be tricky enough even when you aren't dealing with complex systems programming problems like web-scale concurrency and real-time performance. While it's possible to solve these common issues with additional tools and frameworks, Go handles them right out of the box, making for a more natural and productive coding experience. Developed at Google, Go powers nimble startups as well as big enterprises that rely on high-performing services in their infrastructure.